Chrome Mesh Wire Baskets, Pull Out Storage Basket Set, for Cabinet Width 300-600mm. Storage basket sets for hinged cabinet doors. Suitable for 16-20 mm thick cabinets. Full extension ball bearing runners included. Application - For front fixing door and hinged door cabinets Installation - Screw fixing Suitable for - General kitchen storage Version - Side mounting / Full extension / Mesh wire baskets Material: Steel Finish: Storage baskets: Polished chrome / Ball bearing runners: Galvanized. Cabinet Width 300mm - Basket Width 205mm. Cabinet Width 400mm - Basket Width 305mm. Cabinet Width 450mm - Basket Width 355mm. Cabinet Width 500mm - Basket Width 405mm. Cabinet Width 600mm - Basket Width 505mm. The item "Chrome Mesh Wire Baskets, Pull Out Storage Basket Set, for Cabinet Width 300" is in sale since Friday, July 6, 2018. 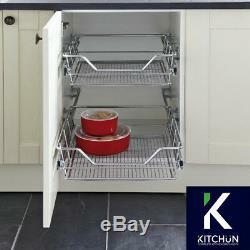 This item is in the category "Home, Furniture & DIY\Storage Solutions\Other Storage Solutions". The seller is "meridien-interiors" and is located in Wimborne.